What a sweet light hearted modern western romance! I thoroughly enjoyed reading Give the Lady A Ride by Linda Yezak. This romance story begins with a change in ownership of the Circle Bar Ranch in Texas. Talon Carlson isn’t sure what to expect when Jake McAllister passes away and leaves the ranch to his New York City niece, Patricia Talbert. As a long time employee, he had hoped that he would inherit the ranch. His dreams for the ranch shatter when Patricia shows up. Patricia is the daughter of a New York senator and she manages his schedule. The slow paced lifestyle on the Circle Bar gives her a chance to re-evaluate the fast-paced, politically motivated life she led in New York. When her best friend Marie, who accompanied her to Texas, falls in love with one of the ranch hands, she uses this excuse to take her time to decide what to do with the ranch. Only, Patricia doesn’t realize that her own heart is slowly drawn to Talon. Both Patricia and Talon must move beyond their past hurts before they can take a chance again. Linda Yezak does a wonderful job of describing the western setting. Though I’ve never been on a working cattle ranch, Linda explained daily life so well that I felt like I was there. She gave wonderful details about bull riding—from training to breeding bulls to riding in competition. The faith aspect was nicely woven into the story. We see characters with strong faith, weak faith, and even no faith, all grow to a new understanding over the course of the story line. Each walk was different and fit the characters perfectly. I would strongly recommend this novel for any fan of contemporary western romance. It’s worth every penny! 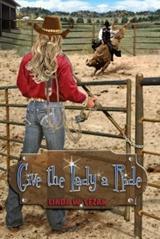 Check out Give the Lady a Ride on the Romance page at Fill Your Kindle Or Nook with GNF! It’s Firesides Read Week. Don’t miss it! I really liked this one too! Great story!